Living in the eternally connected 21st century, I have listened to more than my share of earphones, ranging from the cheap plastic earbuds that come with portable iDevices to pricey models that will set you back more than three figures. “In-ear monitors” or IEMs are earphones designed to perform well above the lowly earbuds and feature advanced audio designs capable of some truly high-end sound. I had checked out the first-generation Shinola Detroit Canfield IEMs earlier this year and was impressed by their ability to reproduce music in a wide variety of resolutions. To meet the growing demand for cordless earphones, Shinola has just released its Bluetooth®IEMs, the subject of the present review. multifunction on/off and wireless connection button, separate up-and-down volume buttons and a charging port for the supplied USB cable. When the multi-function button is depressed for five seconds, it flashes white; a steady white light indicates a solid wireless connection. An orange light shows that it is time to recharge and, long-haulers take note, these earphones will play up to twelve hours on a single charge. The batteries shut down when no signal is present for ten minutes. These new IEMs come in silver or black stainless steel with PVD coating and have 8.5 mm beryllium dynamic drivers, ostensibly the same ones used in my previously reviewed Canfield IEMs, the result of Shinola’s collaboration with Campfire Audio. 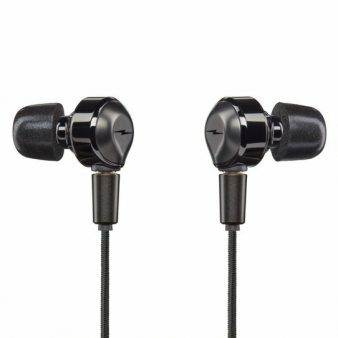 Similar to the Canfield IEMs, these new earphones come with a protective zippered carrying case that also contains the charging cable and silicone earpieces in three different sizes. These Bluetooth®IEMs will play back files of nearly every current resolution but will downscale higher resolutions to a default 48kHz/24-bit by way of Qualcomm aptX HD coding. AAC (Advanced Audio Coding) will beef up the audio playback of music files stored on Apple devices. I paired the Shinola Bluetooth®IEMs with an iPhone 7, an iPod Nano, and a MacBook Air, all typical sources for earphone listeners. The playlists below included many of the same selections used during the review of the original Canfield IEMs (which were available for comparison). The higher resolution files on the MacBook Air sounded airy and belied the fact that I was listening to most at lower than their native sampling rates. A number of tracks featured voice and/or solo instruments that subject the earphones’ diminutive drivers to the so-called audio acid test. The Bluetooth®IEMs delivered voices that were warm and full while piano chords and overtones were quite ample if not the last word in bass response. The opening drumbeats of “Hotel California” were solid and well-articulated, while the infectious voice/bass patter of “Inutil Paisajem” was clean as a whistle. If these new IEMs yielded anything to their cord-carrying Canfield brethren, it was only apparent in the highest resolution sources that the Canfields handled in their native sampling frequencies and word lengths. To be candid, such differences would be far less obvious to typical listeners than they were to me. All the CD-resolution tracks played back through the Bluetooth®IEMs made my professional ears smile quite broadly. The improved sound of mp3 files on my iPhone and iPod was similar to what I had experienced with the Canfield IEMs. Okay, I know that these are highly compressed, lossy sources but there seemed to be a lot more going on with them and there was less edginess than when heard through the standard plastic Apple earbuds. As an example, the tricky guitar solo in Rick Astley’s “It would take a strong man,” was quite well-defined on a note by note basis. I would have to call any contest between the Shinola Detroit Canfield IEMs and these new Bluetooth®babies pretty much a draw in the essential aspects of music reproduction. These are, by a considerable margin, the best-sounding wireless earphones that I have ever heard and ones that I could live with happily ever after. 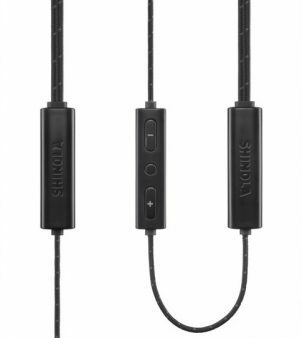 Those considering these earphones for getting their music on-the-go would need to decide if cutting the cord is worth the extra hundred bucks that separate these two outstanding earphones. The need to recharge every twelve hours will be a non-issue for most listeners as their robust internal batteries will keep your listening session intact far longer than their attention span. A definite “best of both worlds” product that receives my highest recommendation. The best wireless earphones that I have ever heard and with the latest aptX encoding firmware, these little guys do justice to music at all resolutions that they were handed.